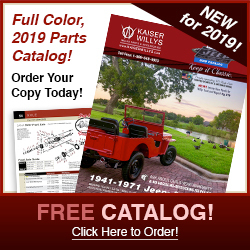 Kaiser Willys Auto Supply, a family owned business for over 10 years, is dedicated to providing quality and reasonably priced vintage Willys and Jeep Parts and Accessories for all 1941 to 1971 Willys & Jeep vehicles. In 2002 we built a 6,000 square foot warehouse to house more than 7,000 parts and to better serve our customers. We guarantee full customer satisfaction – our goal is to make every first-time customer a lifetime customer! We provide vintage Willys parts to museums, repair shops and thousands of Jeep enthusiasts worldwide! Our knowledgeable and friendly staff is always ready to provide assistance, whether you are working on a basic brake job or a full “body-off” restoration. If you need to place an order or just need technical advice, please feel free to call us at Toll Free 1-888-648-4923. I’m a Jeep owner and memorabilia collector and have used your parts and services countless times over the last decade. To other jeep collectors out there, I came across this beautiful 1:8 model of a Willys MB jeep scratch built out of brass. It seems to be quite rare. I have no collection to the seller but thought other visitor might find it interesting. Hi. I am currently doing upgrades on my newly bought 1950 willys wagon. Thank you for all the great parts and services. I am about to refurbish the rear axle (Dana 44) . Did this rear axle come with posi.or is it open like the front? I’m putting a locker in the front with lockout hubs and was wondering what it came with. Looking to find the model year for a dauntless cj5 serial # 8305 A 212131? I just bought an old Kaiser Jeep Corp Dauntless CJ5. How can I find out the model year I have the serial # 8305 A 212131? I can find vin#s on my wagon😫I do have engine #s… 4J321800 would love some info? Yes, we do have mechanical parts available. Brakes, engine, etc. Give the guys at the parts counter a call toll free 1-888-648-4923 or email mike@kaiserwillys.com Mon-Fri 9AM-5PM EST with the parts you need and they will be happy to help! Have a great day! Factory options varied at each dealership for each year. got a jeep with vin # 8305 S ###### what does the S signify? and I do not know the yr model can anyone help ? 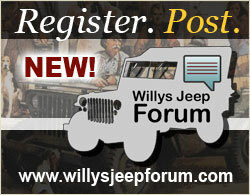 Send an email to amy@kaiserwillys.com with some pictures and the serial number of the Willys Jeep. We will try to help figure out the correct year. Have a great day! I have a Willys that’s been around the family for 60 yrs and I’ve always been told it was a 41 but the name plate says delivered in 42 but it doesn’t have a split windshield and has a tailgate…any ideas? Yes we have a Facebook page! Go to https://www.facebook.com/KaiserWillys and check us out! Have a great day! Hi Bomber, Late 1949 they started to offer it. Mostly it was in 1950. Let us know if you have any other questions. Have a great day! When was the F head first available in the VJ? I have seen reports that say 1949, your website history says 1950, is there any way to know for sure? I’m looking at a 1949 body (flat grill) with an F-head added as part of the resto and it has been accepted by the local Willys club as genuine specs. By the serial number it looks like your jeep is a 1963 CJ-5. If you have any other questions let us know! I am looking at starting a new project. I’m not positive on the year model…..56-63? The serial # is 57548–159679. can anyone help in pinning down the year model??? 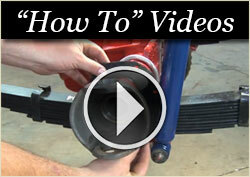 What power steering gear will work for a CJ5? Finally getting ready to go look at a Willys Wagon to buy. My only concern before I get there is will I fit, I’m 6’04 and don’t want to bump me head. Can someone let me know If I’ll fit before I go? My `53 station wagon is coming along nice & even though its not 100% original the charm of the Willys and its permanent place in America’s “Those were the days” makes everyday of searching high and low worth it. I would love to say THANK YOU to Mike who was not only pleasant while ordering my suspension kit; He was willing to do his best answering my questions. Mike even lead me to another great Willys source for my back 60/40s George from Montana Overland. I got the engine un stuck on my M38A1. PB Blaster, this stuff is almost as good as me. A real good day. Looking for front brush guard assembly and rear radius corners. Any suggestions appreciated. It sounds like the fuel pump. Give Mike a call Toll Free: 1-888-648-4923 he will be glad to help you out on this. Have a great week!! I have a 1947 cj2 L134, I’am getting gas in my oil, can any one tell me what causes this. 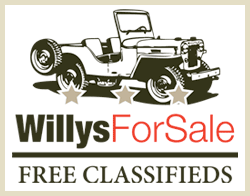 Hi Greg, I’ll be happy to help in any way that I can – Can you email some photos of your friend’s Willys to me at “webmaster@kaiserwillys.com”? Thanks! Rachel H.
Originally they used a 6.00 x 16″ tire but the 7.00 x 16″ fit great too. They will not scrub. Do you have here in CA? My dad like vintage jeep, and we are planning to get one for my him. I sent your question about the Jeepster lit. to Mike Meditz at Kaiser Willys. He should be able to help you with that – Let me know if you need anything else! I just inherited a 1950 willys Jeepster that needs a lot of work, do you have a mechanics manual and a histiory of the jeepster. I have a j-200 with the triftside bed with the gladiator hood. I have had it since 1977. It was titled 1965 but everything points 63 or 64 as to when it was made. The tag on the door frame is Willys not Kaiser. I had sent Mike a picture of it about 4 years ago. I will be sending some for the site soon. Kaiser Willys is located in Aiken, SC. I don’t know anyone at the moment who has a J-200 4×4 like the one you are asking about, but if I come across something like that I will let you know! Where are you located? Do you know anyone who has a Jeep J-200 Thriftside 4×4 truck (with a gladiator type hood???? ?